Norma Rebecca Klukken, the daughter of John O. and Helga (Vangstad) Klukken, was born in Gordon township of Todd County, Minnesota on September 27, 1925. Norma was raised on a family farm and assisted her father in record keeping for his insurance business. She attended District # 63, Osakis High School, class of 1943. She went to Valley City University in North Dakota, graduating with a teaching degree in 1945. 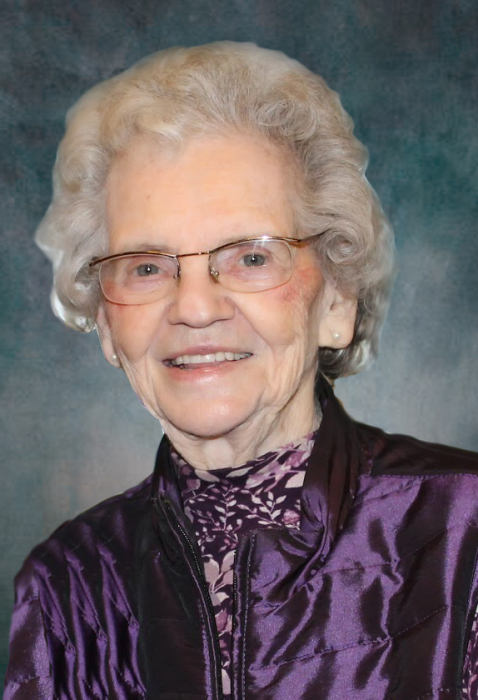 She taught in Ashby, Wheaton, Osakis, and at District 101 near Osakis, and a passion for children and teaching continued for all of her life. Norma was married to Orville B. Larson on June 6, 1948 at Elim Lutheran Church of rural Osakis, and they began a life together that touched countless lives. They were married for over 63 years, together raising their seven fortunate children on the farm, demonstrating for them the qualities of integrity, hard work, kindness, and grace. Though farm life could be difficult and luxuries were few, Mom and Dad filled the home with laughter and love, prayer and song. They continued to live and work on the farm until Dad died on September 22, 2011. At that time Mom moved into Alexandria to be closer to her family. Mom loved to stay connected to family and friends through phone calls and letters, and later, emails and texts, and she used these as encouragements and reminders of her love and God’s promises and that she was praying. The relationships with friends and her extended family were very valuable and important to her. Mom loved music, especially hymns, and her home was filled with it, either from the radio or recordings or singing. She often sang to and with her family and continued this practice even in her last hours. Mom will be missed desperately by those who have been touched by her unconditional love and support. In her final days she was still teaching us, still showing us how to live, how to love, how to trust, how to finish well. Mom died on Sunday, September 9, 2018, at the age of 92, at her home in Alexandria with her children at her bedside. But she lives forevermore in the presence of Jesus. She is survived by her grateful children; Myron (Cheryle) Larson of Alexandria, Becky (Steve) Moltumyr of Omaha, NE, Kathy (Rodney) Garvin of Fergus Falls, Allen (Deb) Larson of Alexandria, Mark (Tracy) Larson of Alexandria, Kurt (Lori) Larson of Alexandria, and Kendal Larson of Alexandria; seventeen grandchildren, fifteen great-grandchildren, brother Lowell Klukken, and sister Gladys Askegard, brother-in-law Wayne Larson, and sisters-in-law Shirley Klukken, Joan Klukken, and many nieces and nephews. Norma was preceded in death by her parents, brothers Phillip, Joseph, Raymond, William, Lloyd; sister Ruth, and grandchildren Greg Moltumyr and Stephanie Larson. Memorial services were held on Thursday, September 13, 2018, at the Calvary Lutheran Church in Alexandria, Minnesota, with Pastor Steve Walswick officiating. Music was provided by Nicholas Larson, Norma’s grandchildren and great-grandchildren, and Lynette Holm, pianist. Private interment services were held at the Bethel Cemetery in Little Sauk Township, Todd County, Minnesota with Myron Larson, Allen Larson, Mark Larson, Kurt Larson, Kendal Larson, Steve Moltumyr, and Rodney Garvin serving as Pallbearers. Visitation was held on Wednesday evening, September 12, at Berea Lutheran Church in Alexandria. Arrangements are with the Anderson Funeral Home in Alexandria.